Tomas Kaberle – Kaberle has been rumoured to be on the move for the last few years, and once again he’ll be the subject of plenty of attention as we approach the deadline. Toronto’s trade of Beauchemin this morning might mean they’re going to keep Kaberle, but it’s tough to know what Brian Burke is up to. Jarome Iginla – A month ago, we were huge advocates of the Flames trading their captain. Since then, Calgary has gone on a tear and the Flames now sit eighth in the Western Conference. Iginla won’t be going anywhere as long as Calgary is in playoff contention, but they could easily drop out by the deadline. Ales Hemsky – Once again, Hemsky has missed significant time due to injury this season. Still, when he’s been healthy Hemsky has produced at nearly a point per game clip. The Oilers are oozing with young talent and may look to spin off Hemsky for yet another young gun. He could provide solid secondary offence for a number of playoff clubs. 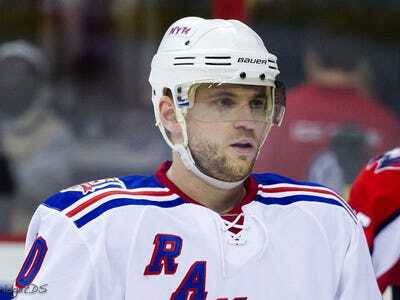 Marian Gaborik – It would take a huge offer for the Rangers to move Gaborik, but Darren Dreger reported this morning that GM Glen Sather is willing to listen. New York has performed well this season despite Gaborik’s invisibility, and if they can get a good package for Gaborik, the Rangers might pull the trigger on a blockbuster. Jason Arnott – The Devils have been the hottest team in hockey over the last month, but they can’t erase their embarrassing first half. New Jersey is still trying to go for it this season, but a couple more losses would extinguish that hope. If that happens, the Devils will listen to offers for any and all of their veterans. Stephen Weiss – Weiss is one of the few talented offensive players the Panthers currently employ, but Florida is in the middle of a rebuilding effort and would be willing to deal Weiss for more young talent. Alex Kovalev – One of the most frustrating players in the history of hockey, Kovalev has tantalising talent but is mind-bogglingly inconsistent. Just about everyone on the Senators will be available at the trade deadline, and no one will be surprised to see Kovalev get moved again. Jakub Voracek – Here’s a puzzling one, but Dreger says the Blue Jackets could move him. Columbus has plenty of young forwards and may see Voracek as expendable, especially if he yields help on defence. Chris Phillips – Once considered one of the better stay at home defenders in the league, Phillips is now an ugly -26. Still, that might be more a product of Ottawa’s ineptness than Phillips’ decline. He’s very likely to be moved, and teams are always looking for blue line help at this time of year. Tomas Vokoun – At times it has sounded like the Panthers were desperate to re-sign Vokoun, but that hasn’t happened, and Florida will be fielding several calls about its goalie. The Panthers do have a superb goalie prospect in Jacob Markstrom, so they might make a move here.